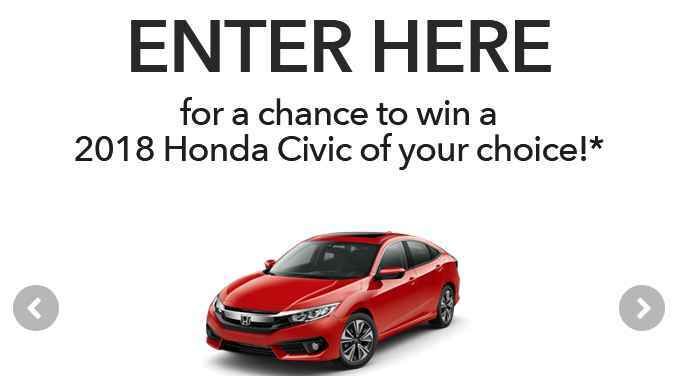 Enter the American Honda Motor’s 2018 Honda Stage At Music Festival Sweepstakes right now for your chance to win a Civic Coupe, Sedan or Hatchback plus you can also have a chance to win a pair of VIP passes to see live music on Honda Stage at this year’s best music festivals. How To Enter: Go to this link:www.music.honda.com during the sweepstakes period and follow the online instructions to register by entering all information requested on the registration form and once you filled out the entry form now Click on the submit button to complete the registration form. Prizes: Two VIP tickets to Governors Ball on June 1–3, 2018, Two VIP tickets to Austin City Limits on October 5–October 7, 2018, Two VIP tickets to Austin City Limits on October 12–14, 2018, One (1) Grand Prize –The option to select one of the following: (1) a Honda Civic Coupe EX-L automobile, (2) a Honda Civic Hatchback EX-L, (3) a Honda Civic Sedan EX-L, or (4) $10,000. Who Can Enter: This sweepstakes is open only to legal residents of the forty eight (48) United States and the District of Columbia who are eighteen (18) years of age or older at the time they enter the sweepstakes. When To Enter: The 2018 Honda Stage At Music Festival Sweepstakes begins at 9:00 a.m. (Pacific Time [“PT”]) on May 17, 2018, and ends at 11:59 p.m. PT on October 31, 2018. Who’s Sponsor: The sponsor of this sweepstakes is American Honda Motor Co., Inc., 1919 Torrance Boulevard, Torrance, CA90501.